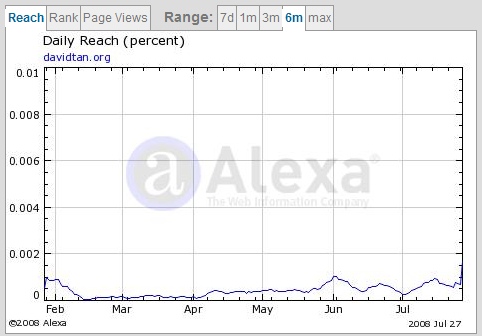 For the first time ever, I’ve finally seen this blog showing some traffic and chart patterns on Alexa after shooting into daily top 100K in Alexa ranking yesterday. For the past few months, it has been gaining stable traffic and Alexa ranking has been improving on a month to month basis. In fact, I should say on a week to week basis. I won’t call this a substantial achievemnet yet but have to say that I’ve seen it coming. Alexa ranking is simply another metric that is often used to measure web popularity and web traffic. Am I extremely happy? Nope, not at all. This is just part of the journey and this should just serve as motivation instead of satisfaction. I certainly hope so. But this is just part of “the game“. There are certainly still room for improvement. 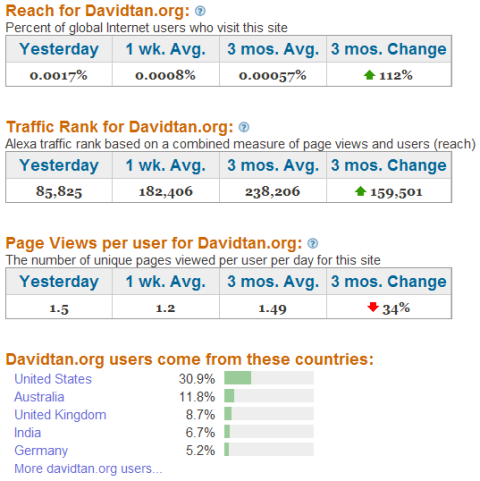 * You can see that I have the 3 months average traffic ranking of this blog at the sidebar. Or you can get more details at Alexa. * You can submit your site to Alexa too. * Do have to point out that “yesterday” (as seen in the pic above) shot into top 100K due to recent surge in traffic from social media.